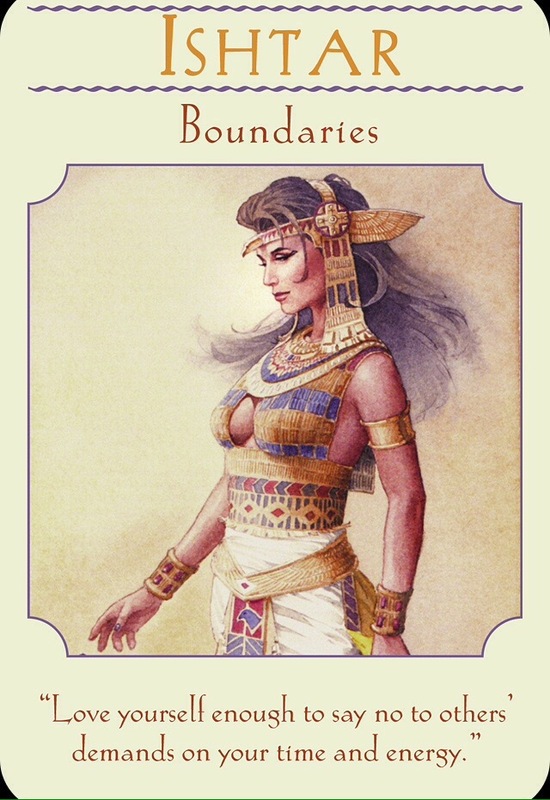 Card: Ishtar – from the Goddess Guidance Oracle Cards by Doreen Virtue. Message from The Faeries: With the arrival of spring, and the celebration of Easter this weekend, we invoke the divine goddess energies for you for this upcoming week. Ishtar is one of the more ancient goddesses and she is very near and dear to our hearts. The reason why we love her so much is that she is not only such a loving, kind and gentle goddess, but she is also so strong, brave and noble. She is a very balanced being. The reason that Ishtar is so evenly balanced is because she knows exactly when to say and and exactly when to say no. Everything she does is with exquisite precision. She says and does everything with careful thought and consideration. Some people think that she is absolute perfection. Truthfully, everything and everyone is already perfect as is. This week it is very important that you say what you mean, and that you mean what you say. It goes the same for your actions. Only do the things that you mean and want to do. Of course, there may be obligations that you can’t get out of that you don’t really want to do. Honour those obligations, but try to find the balance by doing the things you really want to do. Know when to say yes and when to say no. The best way know is to listen to your heart and follow your hearts instructions. Listen carefully and be true. If you find yourself having to say no to someone and it’s hard to do, remember that you don’t have to use force to communicate. It’s okay to show remorse and be vulnerable in your truth. You can always say something like: “I really want to be able to say yes and help you right now, but I am not able to today. I’m sorry I can’t help you.” We have observed that some people feel the need to be cold or harsh when they say no, and this not very graceful. Try to use your grace when you have to say no, it will help yourself and the other person to accept your truth. This entry was posted in Faerie Reading and tagged doreen virtue, Easter, faeries, fairy, Goddess, Oracle, spring, Tarot by faeriemessenger. Bookmark the permalink.